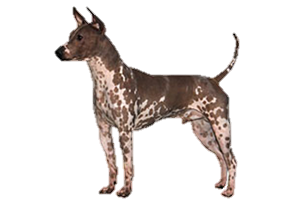 Although bred from terrier stock, the American Hairless Terrier has always been developed and kept solely as a companion. Unlike many dog breeds, the exact origin of the American Hairless Terrier is no mystery. In 1972 a hairless female pup was born in a litter of Rat Terriers. These terriers were owned by Willie and Edwin Scott of Louisiana, who took great interest in her lack of fur and named Josephine. In turn Josephine only produced a single hairless female in her first litter and no other hairless pup was born to her for eight years. Then, at the age of nine, she had another litter with two hairless pups, one male and another female. These few dogs slowly become the foundation for the Scott's breeding program. Although the first pups were inbred, a careful, continued program has secured a true breeding stock that continues today.